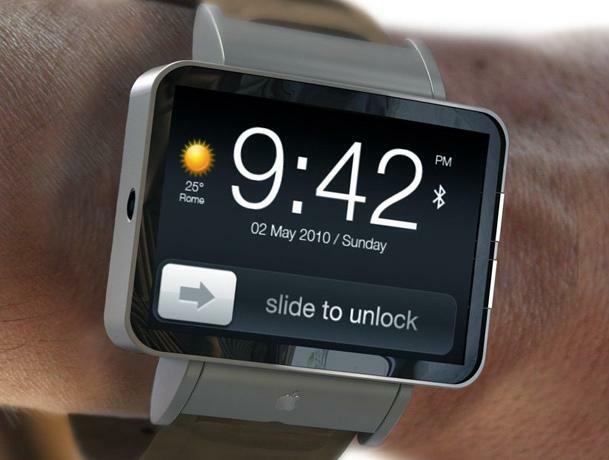 A concept design of the Apple iWatch. The trademark application was filed with the Japan Patent Office on June 3 for a wide range of product categories, including "computer," "computer peripheral," "GPS device," and "voice recognition software." The application was made public June 27, and is still being reviewed by the office, a process that can take months. Earlier this month, a Russian news site reported that Apple filed for the "iWatch" trademark in that country. Several patents in the U.S., including one for a curved battery and another for a flexible display that be used in a flat or curved state, and news reports indicate Apple is working on a watch-like device. Last week Sony announced the latest version of its SmartWatch, a water-resistant device with NFC. The Sony watch acts mainly as a peripheral for a smartphone, syncing via Bluetooth and showing alerts for services like Facebook, Twitter and email. It also can download scaled down versions of apps and customised watch faces.